The Rave Industry is somewhat saturated with artists and festivals. Boxed by commercialism, only a few try to make a difference in the sea of sameness. But there will always be good music, and interesting artists just looking for opportunities to be seen and heard in EDM’s process of evolution. And because fans deserve something new, a new sound and a new experience, we dare to bring them to you. 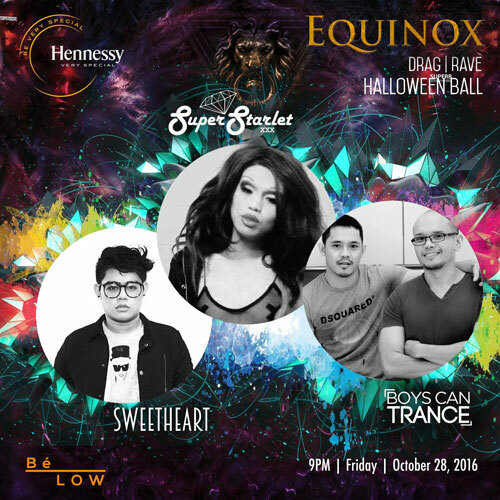 Headlining this event are up and coming Filipino LGBT superstar artists: DJ SweetHeart, SuperStarletXXX and DJ Duo “Boys Can Trance”. The Ball will also feature a mini Drag Battle segment where Amateur Drag Enthusiasts will lipsync and Dance for their life. Suprise live vocals and performances are also being lined up for the event. We are taking the opportunity to make a difference and in true spirit of PLUR (Peace, Love, Unity and Respect) we are immersing the RAVE party goers to different subcultures through Music, Artistry, Self Expression and Creativity. The event serves also as an avenue for promotion of different advocacies concerning self worth, responsible reproductive and sexual health, HIV awareness, treatment and management and sexual orientation and gender identity and expression. Happening this Friday; October 28, 2016, 11:59PM until morning at the newest Super Club in the Metro; “BeLOW”- Driveway Exit, New World Hotel Makati (beside Greenbelt 3). Tickets – where to get them and how much do they cost? Tickets are pre-sold at PHP 350 (w/ 1 free Hennessy VS Cocktail) and can be purchased at SM Ticket Centers at all SM Malls nationwide or online via SM Tickets (click here to be brought to the link directly). Tickets will be sold at Php 400 at the venue on the event date. 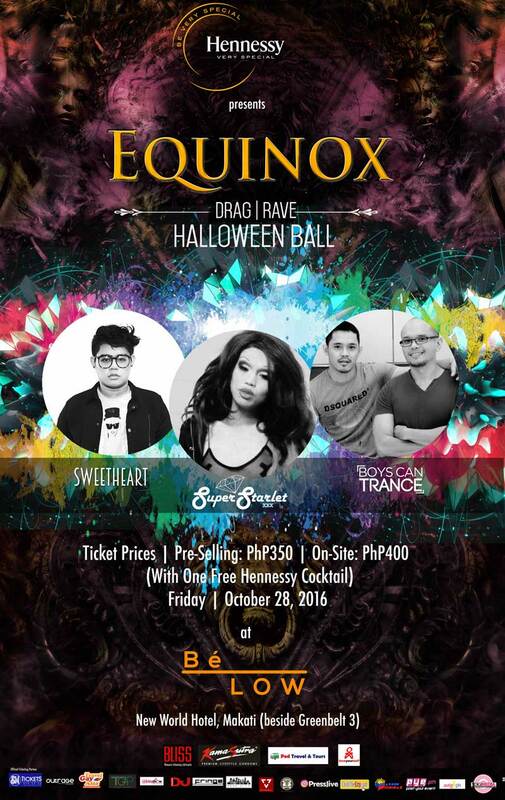 For inquiries and table reservations, kindly contact Equinox Hotline (09064549523) or private message Emergence on Facebook. So what should everyone expect on October 28? Equinox, a balance of elements in a mix of different subcultures. An Unforgettable experience, a happy place – a Very Special Night for everyone!